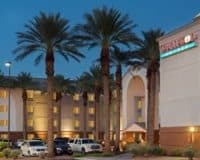 The Courtyard by Marriott, 3275 Paradise Road, specializes in business people and offers everything they need to have a productive and enjoyable stay in Vegas. The Courtyard by Marriott at the Las Vegas Convention Center, lies just two miles East from the legendary Vegas Strip, offering easy access to a vast array of amazing activities. This is enhanced by the fact that it lies close to the monorail line, providing a simple and traffic-free method of traveling into town. The other advantage of the hotel, is its close proximity to the Las Vegas Convention Center, making it ideal for any business that is hosting an event there. The hotel offers all the of the business-friendly amenities that you would expect, including several meeting rooms and complimentary WIFI across the entire property. 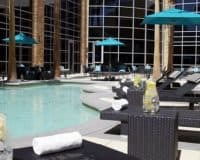 These combine with plenty of ways to relax, such as a refreshing outdoor pool, a well-equipped gym, a Starbucks to help you start your day the correct way, and a multitude of bars, which are the ideal place to relax or entertain clients. The accommodation is spacious and comfortable, meaning that you are guaranteed to get an excellent night’s sleep, be you in Vegas for work or pleasure. The bedding is expensive and soft, all the rooms have WIFI and there is plenty of space to work in all of the rooms. 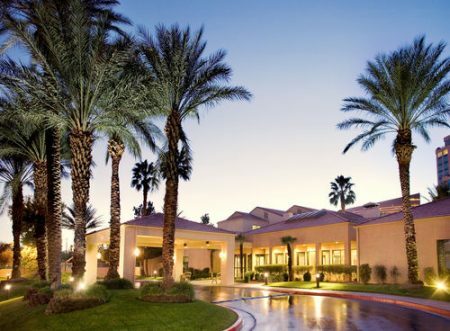 The Courtyard by Marriott specializes in business people and offers everything that they need to have a productive and enjoyable stay in Vegas. 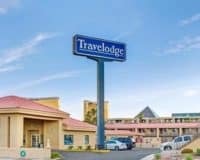 The staff are friendly and helpful, there is plenty of space to work and everything in the city is easily accessible, without being so close that the bright lights of Vegas will distract you from your work.